Wondering what Disneyland special events may be happening during your visit to Disneyland Resort? Listed below are the major Disneyland events and festivals taking place during the year. On this page you will also find any deals and discounts available on special activities (spa treatments, movies and more) at Disneyland Resort, as well as how to save money on theme park tours. This is an UNOFFICIAL listing of Disneyland special events, tours and activities, and while we make our best effort to keep it updated, complete and accurate, Disney changes things constantly. Be sure to call ahead before making any major plans based on the information below! For recurring events (e.g., Mickey’s Halloween Party, Disney California Adventure Food & Wine Festival) we update new information as it becomes available, but we do not remove the previous year’s information until the new year’s information becomes available. We do this so that you can get a general idea of what has been offered in the past, and the range of dates when it was offered. Disneyland stays open late on New Year’s Eve and offers extra entertainment, usually including live performances, an extra parade and fireworks. These festivities are included in regular park admission. If you plan to visit one of the theme parks on New Year’s Eve (December 31) or New Year’s Day (January 1), be aware that these are two of the busiest days of the year. The parks (especially Disneyland) usually reach full capacity at some point during the day, and you may not be admitted (or re-admitted) to the parks after that point. (This is true even if you have a ticket, even if you’re staying at a Disney resort and even if you have dining reservations in the park. If the park is full, it’s full — Disney has to follow fire codes!) For that reason it’s best to arrive first thing in the morning and stay in the same park all day. Bring any sweaters or jackets you may need later and stow them in a locker when you arrive (the lockers will also sell out). Get Fastpasses right away if you think you will want to ride anything, because the lines will be very long by noon. Disney hotels may offer a special dinner or party for New Year’s Eve, to find out go to the Disneyland dining page. In 2019, Día de los Reyes was celebrated January 3-8. January 6, Día de los Reyes (Three Kings Day, also known as Epiphany or the Twelfth Day of Christmas), is a popular holiday in Mexico. The holiday celebrates the arrival of the Magi bearing gifts for baby Jesus, and Día de los Reyes is the traditional day for Mexican children to receive Christmas gifts. The celebration in Paradise Garden at Disney California Adventure includes entertainment, Disney characters in festive attire, kids’ activities and specialty food items. It is the grand finale of Disney ¡Viva Navidad! Due to the ongoing construction for the Disneyland Resort expansion, all runDisney race weekends at Disneyland Resort are on hiatus. This includes the associated Coast to Coast Race Challenges. For more information, go to the runDisney website. In previous years, the Star Wars Half Marathon Weekend – The Light Side took place in mid-January. The Star Wars Half Marathon Weekend – The Light Side includes a 10K, 5K, Kids’ Races and a 13.1-mile run that takes you through Disney California Adventure, past Disneyland, and then on to the streets of surrounding areas. Those who complete the Star Wars 10K on Saturday and the Star Wars Half Marathon on Sunday receive the Star Wars Rebel Challenge Finisher Medal in addition to the Half Marathon and 10K Finisher Medals. In 2019, Lunar New Year was celebrated January 25 – February 17. The Lunar New Year celebration takes place at Paradise Gardens in Disney California Adventure and includes traditions from Chinese, Korean and Vietnamese cultures. In addition to the Mulan’s Lunar New Year Procession parade, there are performers, musicians, local artisans, kids’ activities and specialty food items. Disney characters are there as well, including Mulan, Mushu, Mickey Mouse and Minnie Mouse. Each night, before World of Color, the Lunar New Year Celebration culminates in a six-minute pre-show called Hurry Home, presented in water, animation and special effects on Paradise Bay. This story of a Little Lantern on its journey home to join its Lantern family to celebrate Lunar New Year features animated appearances by Mulan and Mushu in “dream sequences” inspired by traditional Chinese paper cut-out style animation. More information can be found on the Disneyland Resort Lunar New Year page. For Valentine’s Day (always on February 14), several Disneyland Resort restaurant offers a special menu including Blue Bayou, Carnation Café, Steakhouse 55, Napa Rose and Storytellers Café. There are also some holiday themed desserts and treats offered throughout the parks and hotel restaurants. You can reserve holiday meals on the Disneyland dining site or by calling 714-781-DINE (3463). For more Valentine’s Day suggestions, take a look at our tips and ideas for adding some romance to a Disneyland trip. In 2019, Celebrate Gospel took place on February 16. To celebrate Black History Month and the spirit and history of gospel music, Disney California Adventure hosts a one day concert featuring gospel choirs from a variety of communities. Performances take place in Stage 17 in Hollywood Land between 11:00 am and 7:00 pm, and are included with theme park admission. In 2019, Celebrate Gospel will feature the following choirs: Amazing Grace Conservatory (Los Angeles), Eastvale Bible Church Mass Choir (Norco), Friendship Baptist Church Mass Choir (Yorba Linda), Greater LA Cathedral Choir (Los Angeles), KJLH Radio Free Performance Choir (Los Angeles), LA Inner City Mass Choir (Los Angeles), Lorenzo Johnson & Praizum (Los Angeles), New Hope Gospel Choir (Orange), Rhythm and Moves Children Youth Choir (Pasadena), Second Baptist Church Mass Choir (Santa Ana), Ty Snow & Xtreme Purpose (Pasadena), Voices of Destiny (Compton), Voices of Life (Riverside), Voices of Unity (The Inland Empire), West Angeles Angelic Children’s Choir (Los Angeles), along with house bands Higher Authority (San Diego) and J. Boykin Gospel Band (Riverside). The New Orleans Square area of Disneyland celebrates Mardi Gras each year. On that day, the streets of New Orleans Square are filled with music, Disney characters, street performers and special food items. This Mardi Gras celebration typically includes performances by Princess Tiana, Louis and Naveen and meet & greet opportunities with Mickey Mouse, Minnie Mouse, Donald, Goofy, Pluto and Chip ‘n’ Dale – all dressed up in their Mardi Gras finest! In 2019, the Disney California Food & Wine Festival will be held March 1 – April 23. The Disney California Adventure Food & Wine Festival celebrates some of the best of California cuisine. Festival Marketplace Kiosks offer California-inspired small plates and beverages at over a dozen different venue. There are Lifestyle Seminars with 20- to 30-minute presentations on a variety of lifestyle topics, live art demonstrations and live musical performances. Kids ages 3-11 can participate in a complementary, hands-on experience called Jr. Chef. Reservations for 2019 Signature Events, such as Dinner with Disney Chefs, Winemaker Receptions at Carthay Circle Restaurant and Sweet Sundays, opened on January 16, 2019. For more information, visit the Disney California Adventure Food & Wine Festival page. In 2019, the Easter Egg Scavenger Hunt will be held April 5-21 in Disneyland, Disney California Adventure and Downtown Disney. Maps and stickers are available for $6.99 plus tax at select merchandise locations. Return your map to Elias & Co. in Disney California Adventure, Disney Showcase in Disneyland or World of Disney Store in the Downtown Disney District to pick up a surprise. Some restaurants offer a special Easter meal. For more information about Easter meals or to make a reservation, go to the Disneyland dining page. In 2018, Pixar Fest was held April 13 – September 3. New for 2018, Pixar Fest is a celebration of friendship and will feature an all-new fireworks spectacular, the return of two favorite parades, more Pixar characters, new décor, atmosphere entertainment and themed food and beverages. Together Forever – A Pixar Nighttime Spectacular in Disneyland Park celebrates the everlasting friendships forged by beloved Pixar pals. The story comes to life through projections on Sleeping Beauty Castle, the water screens of the Rivers of America, the façade of “it’s a small world” and the buildings of Main Street, U.S.A. This nighttime spectacular will feature a special flyover by Buzz Lightyear at Sleeping Beauty Castle. Paint the Night parade will be in Disney California Adventure. The parade features many Pixar stories, including characters from Toy Story, Monsters, Inc. and Cars, and another Pixar story will join Paint the Night later in the year. There are several Paint the Night dining packages available that include admission to a reserved seating area. Pixar Play Parade will make its way through Disneyland for the first time. The parade will begin as most Pixar films have, with an appearance by the Pixar lamp. Other new parade elements will feature characters from Up and Inside Out. There is a Pixar Play Parade dining package that includes a FastPass for a reserved seating area. The Pixar Shorts film festival in Disney California Adventure will feature rotating favorites such as For the Birds and Lava at the Sunset Showcase Theater in Hollywood Land during most of Pixar Fest. The Paradise Gardens area will feature a new Pixar-themed musical troupe along with Pixar character greeting opportunities along with crafts and activities for children. For more information, visit the Disneyland Resort’s Pixar Fest page. In previous years, the Tinker Bell Half Marathon took place in mid-May. The Tinker Bell Half Marathon Weekend events include a 10K, Family 5K, Kids’ Races and a 13.1-mile run that takes you through Disneyland. In 2019, Disneyland After Dark: Heroes Assemble will take place on April 30 and May 1 in Disneyland California Adventure. Disneyland After Dark is a separately ticketed after-hours event, offered from time to time. Each Disneyland After Dark event features specialty entertainment, themed food, collectible merchandise and more. The event runs from 9:00 pm until 1:00 am and select attractions will be open. Disneyland California Adventure mix-in begins at 6:00 pm. Super Hero fans of all ages are invited to come dressed in Super Hero attire and experience special entertainment, character encounters, photo opportunities, a park-wide scavenger hunt and more — all themed to some favorite Super Hero stories. Select attractions in Disney California Adventure will be open, including Guardians of the Galaxy – Mission: BREAKOUT! Attendees receive a commemorative guide map, event credential and unlimited downloads of Disney PhotoPass photos taken during the event. Tickets cost $109 per person (age 3 and up). Tickets for Disney After Dark: Heroes Assemble go on sale for Disneyland Annual Passholders on February 19, 2019 and for the general public on February 21, 2019. There are a limited number of tickets for this event. For more information or to purchase tickets, visit the Disneyland After Dark: Heroes Assemble page. In 2019, Mother’s Day is May 12. On Mother’s Day, the second Sunday in May, Blue Bayou Restaurant and Carnation Cafe have offered special meals. Steakhouse 55 at Disneyland Hotel offers a Mother’s Day-themed dessert at their Afternoon Tea on select weekend dates near Mother’s Day. Other restaurants may offer special meals as well. For more information about Mother’s Day meals or to make a reservation, go to the Disneyland dining page. In 2018, On July 4, Disneyland Park had a special patriotic finale after Together Forever – A Pixar Nighttime Spectacular. In 2018, on July 4, the 1st Marine Division Band participated in the daily flag retreat ceremony at Disneyland Park, followed by a pre-parade performance from Town Square to “it’s a small world” before the 6:00 pm showing of Pixar Play Parade. At 7:00 pm, the band performed a special concert at Fantasyland Theatre. If you plan to visit Disneyland on Independence Day (July 4), be aware that it is one of the busiest days of the year. The park may reach full capacity at some point during the day, and you may not be admitted (or re-admitted) after that point. (This is true even if you have a ticket, even if you’re staying at a Disney resort and even if you have dining reservations in the park. If the park is full, it’s full — Disney has to follow fire codes!) For that reason it’s best to arrive first thing in the morning and stay in the same park all day. Bring any sweaters or jackets you may need later and stow them in a locker when you arrive (the lockers will also sell out). Get Fastpasses right away if you think you will want to ride anything, because the lines will be very long by noon. New!The 2019 CHOC Walk will be August 11. This annual charity walk at Disneyland is a fundraiser for Children’s Hospital Orange County (CHOC). The walk passes through Disneyland and Disney California Adventure, followed by festivities in Downtown Disney. For more information, visit the CHOC Walk in the Park website. In previous years, the Disneyland Half Marathon Weekend took place late August/early September. The Disneyland Half Marathon Weekend has been affectionately dubbed The Happiest Race on Earth. The 13.1-mile route takes runners (or joggers or walkers) through the two Disneyland theme parks while colorful Disney characters and festive music inspire them along the way. New!In 2019, Halloween Time at Disneyland Resort will be September 6 – October 31. During this time period Disneyland Resort visitors will find Disney characters in seasonal costumes, whimsical décor, decked-out attractions and special seasonal treats. Halloween Time experiences include special meet-and-greets with Disneyland characters in their Halloween costumes and spooky-silly holiday themed decorations. There is also Mickey’s Halloween Party, a separately ticketed night time event which gives kids and their families the opportunity to dress in their Halloween costumes and trick-or-treat throughout Disneyland after it has closed to day guests. Each night Guardians of the Galaxy – Mission: BREAKOUT! will turn into Guardians of the Galaxy – Monsters After Dark. As night falls, The Collector’s Fortress goes dark, alarms sound and all-new lighting on the exterior of the Fortress alerts guests that something inside has gone awry. Rocket discovers that in the hurry to free his friends (during the day), they have inadvertently left Groot behind. Now Rocket needs to distract all the monsters he has unleashed inside the Fortress, and he enlists the guests to help. Buena Vista Street will be decorated with Halloween decor inspired by Tim Burton’s The Nightmare Before Christmas and Mickey Mouse and his friends will be decked out in their costumes. Oogie Boogie’s oversized silhouette beckons guests through the main entrance as a swarm of bats encircle Carthay Circle Theatre. A 10-foot-tall statue of the Headless Horseman of Sleepy Hollow, holding his jack-o’-lantern head up to the sky, will be in Carthay Circle. In Cars Land, the citizens of Radiator Springs don their Halloween costumes and decorate their homes to celebrate Haul-O-Ween. From Fillmore’s Jack-Oil Lanterns and Flo’s Spider-Car to Witchy Miss Lizzie’s shop, everybody’s doing all they can to turn Radiator Springs into Radiator Screams! Mater’s Junkyard Jamboree becomes Mater’s Graveyard JamBOOree and Luigi’s Rollickin’ Roadsters transforms into Luigi’s Honkin’ Haul-O-Ween. In New Orleans Square, Jack Skellington and his friends to transform the Haunted Mansion into the seasonal Haunted Mansion Holiday. Inspired by the animated film Nightmare Before Christmas, Haunted Mansion Holiday depicts the holiday mayhem that occurs when Halloween and Christmas traditions collide. Frontierland pays tribute to Día de los Muertos, an Hispanic observance, with a traditional skeleton display. Main Street, U.S.A. celebrates with the Main Street Pumpkin Festival – more than 300 pumpkins will be on display in shop windows and none of them are the same! In 2018, Space Mountain offered a Halloween overlay (the “Ghost Galaxy” overlay first introduced at Hong Kong Disneyland). Space Mountain vehicles are thrust into a ghostly galaxy where they are bombarded with eerie screams, sound effects and music. Spine-chilling spirits pop out of the darkness, appearing to reach out and menace space travelers. For more information, visit Disneyland Resort’s Halloween Time at Disneyland Resort page. New!In 2019, Haunted Mansion Holiday will run September 6 – October 31. In the past, this overlay has stayed up into early January, but currently Disneyland lists it as ending October 31. The holiday-enhanced version of the attraction is a Disney California Adventure celebration where the traditions of Halloween and Christmas collide. The ghoulish but well-meaning Jack Skellington from the film Tim Burton’s The Nightmare Before Christmas comes to the Haunted Mansion to transform it with his skewed vision of the holidays. The Hatbox Ghost, who recently rejoined the Mansion’s happy haunts, is staying to celebrate Halloween and Christmas with Jack Skellington and his friends. Inside the Mansion, you will find a Haunted Mansion Holiday gingerbread house. In 2018, Mickey’s Halloween Party was held September 19, 21, 24, 26, 28; October 2, 5, 9, 12, 16, 19, 23, 26, 29 and 31. Mickey’s Halloween Party is held on select nights in September and October at Disneyland Park and Disney California Adventures after the regular closing of Disneyland Resort and requires separate admission to attend. Attendees can enter both Disneyland Park and Disney California Adventure Park for up to 3 hours before Mickey’s Halloween Party begins. The 5-hour party includes the “Halloween Screams” fireworks spectacular, the “Frightfully Fun Parade” led by the Headless Horseman, meet and greets with villains at Villain’s Square and Disney characters in their Halloween costumes, special treat stations offering both yummy candy and healthy goodies and more! Purchasing a Mickey’s Halloween Party Dinner Package gives you access to a reserved viewing area for the “Frightfully Fun Parade”. All event attendees – including adults – may dress in their favorite Halloween costume but must follow strict guidelines. See Disneyland.com/party for full details. Guests who do not adhere to these guidelines may be refused entry into the event unless their costume can be modified to meet the standards. Gate prices are $130 on October 19, 26, 29 & 31; $115 on all other nights. Advance purchase prices for general public: $105 on September 19, 24, 26. No advance purchase discount on tickets for September 21, 28; October 2, 5, 9, 12, 16, 19, 23, 26, 29 and 31. Advance purchase prices for Disneyland Resort Annual Passholders, Disney Visa cardholders and Disney Vacation Club members: $95 on September 19, 24, 26. No advance purchase discount on tickets for September 21, 28; October 2, 5, 9, 12, 16, 19, 23, 26, 29 and 31. 2018 Mickey’s Halloween Party tickets went on sale for Annual Passholders, Disney Visa cardholders and Disney Vacation Club members on June 5. Tickets for the general public went on sale June 12. Tickets may be purchased online at Disneyland.com/party, by calling 714-781-4400, or at the Disneyland main gate. Online purchase is not available on the day of the event. Limit 8 tickets per person, per event date. Each ticket is valid for admission to the event on the specified event date. Tickets are not valid for theme park admission prior to the hours of the event, except as noted above. Admission includes Disney PhotoPass. Please note: Parking is no longer included with your ticket purchase. In 2018, the Mickey’s Halloween Party Dinner Package, part of Mickey’s Halloween Party, was offered on September 19, 21, 24, 26, 28; October 2, 5, 9, 12, 16, 19, 23, 26, 29 and 31. This separately ticketed premium event includes a 3-course, prix-fixe dinner at Blue Bayou Restaurant and access to a reserved viewing area for the Frightfully Fun Parade. Viewing areas are standing only, with accommodations for guests with disabilities. The Mickey’s Halloween Dinner Package costs $74.35 per adult and $31.25 per child (age 3 to 9), including tax. Admission to Mickey’s Halloween Party is required and not included in the price. Reservations are highly recommended. To book a reservation for the 2018 Mickey’s Halloween Party Dinner Package, go to the Blue Bayou Restaurant booking page or call (714) 781-DINE (3463). Please note: admission to Mickey’s Halloween Party is required and is not included in the price. In 2019, Oogie Boogie Bash will be held September 17*, 19*, 22, 24*, 26*, 29; October 1, 3, 6, 8, 10, 13, 15, 17, 20, 22, 24, 27, 29 and 31. Oogie Boogie Bash – A Disney Halloween Party will be held on select nights in September and October at Disney California Adventure after the regular closing of Disneyland Resort and requires separate admission to attend. Attendees can enter Disney California Adventure for up 3 hours before the event starts on Tuesday and Thursday nights (excluding October 29 and 31) or up to 4 hours on Sunday nights, plus October 29 and 31. Villainous! – A new World of Color show that explores the villainous side of Disney characters through fountains, lights, lasers, projections and special effects. Redwood Creek Challenge Trail – Transformed into a world of Disney villains, Redwood Creek will be tricked out in a dreamlike environment. Frightfully Fun Parade – The Headless Horseman of Sleepy Hollow starts the procession, followed by Mickey Mouse and Minnie Mouse, and includes many mischievous Disney villains. Mickey’s Trick and Treat show – This new, interactive stage production invites kids of all ages to join Mickey Mouse and his pals as they throw a one-of-a-kind Halloween party! Enjoy dancing, not-so-frightening scary-tales, and candy at the Disney Theater in Hollywood Land. There will also be treat trails throughout the park for trick-or-treating, a dance party and character meet and greets. All event attendees – including adults – may dress in their favorite Halloween costume but must follow strict guidelines. See Disneyland.com/HalloweenParty for full details. Guests who do not adhere to these guidelines may be refused entry into the event unless their costume can be modified to meet the standards. *Disneyland Resort Annual Passholders can buy discounted tickets for select dates in September. 2019 Oogie Boogie Bash tickets go on sale for Disneyland Resort Annual Passholders, Disney Vacation Club members and Disney Visa card holders on April 23, 2019. Tickets for the general public go on sale April 30, 2019. Tickets may be purchased online at Disneyland.com/HalloweenParty, by calling 714-781-4636, or at the Disneyland main gate. Online purchase is not available on the day of the event. Limit 8 tickets per person, per event date. Each ticket is valid for admission to the event on the specified event date. Tickets are not valid for theme park admission prior to the hours of the event, except as noted above. Please note: Parking is not included with your ticket purchase. New!In 2019, Día de los Muertos will begin September 6. In Disneyland Park, Zócalo Park in Frontierland will have a colorful display featuring marigolds and papel picado, along with a traditional ofrenda, calaveras (sugar skulls), an iconic figure of La Catrina and food at Rancho del Zócalo. In 2018, Disney California Adventure, Plaza de la Familia, held at Paradise Gardens, celebrated Disney·Pixar’s Coco and the everlasting bonds of family. Families visiting Plaza de la Familia can share memories of loved ones at the interactive Memory Wall. There will also be a World of Coco exhibit, a Tree of Life interactive photo location, a mask-making activity and Mexican food. “A Musical Celebration of Coco,” performed several times a day, will feature storytellers, the Mariachi Divas and authentic Folklórico dancers to tell the story of Miguel’s journey in Coco. Ramone, one of the citizens of Cars Land, also paid tribute to Día de los Muertos. Ramone celebrated with a full-sized Sugar Skull Car and a traditional “ofrenda” display honoring the gone, but not forgotten, Doc Hudson. For more information, check Disneyland Resort’s Día de los Muertos page. In previous years the Super Heroes Half Marathon Weekend took place in mid-November. The Super Heroes Half Marathon Weekend at Disneyland is a three-day race weekend that features kids races, the Captain America 5K, the Dr. Strange 10K and the Avengers Super Heroes half marathon, plus several family-friendly events such as a Health & Fitness Expo. The Half Marathon course is a 13.1-mile route through Disneyland and the surrounding areas that differs from the Tinker Bell and Disneyland half marathon courses. Runners who successfully brave the Avengers Super Heroes Half Marathon course receive a commemorative Avengers-themed finishers’ medal. Disneyland does not offer a Thanksgiving parade or decorations in the parks. However, the Christmas decorations are in place in the parks by Thanksgiving weekend and the Christmas Holiday events are well underway by that weekend. A Disney Family Thanksgiving Feast is usually offered in the Grand Ballroom of the Disneyland Hotel on Thanksgiving Day. Many other restaurants on property also offer Thanksgiving menus. For more information about Thanksgiving meals or to make a reservation, go to the Disneyland dining site or call (714) 781- DINE (3463). For 2018, Holidays at Disneyland was November 9 through January 6, 2019. The park decorations start going up gradually right after Halloween and are complete by the beginning of the official holiday period. The ABC-TV Disney Christmas Parade special (which is broadcast on Christmas Day) is filmed in part at Disneyland, usually on the first or second weekend of November, so the decorations on Main Street, U.S.A. have to be in place by then. Once the holiday period officially begins, Disneyland guests can enjoy a nightly holiday fireworks spectacular – Believe…in Holiday Magic. During the holidays, the fireworks show concludes with a magical snowfall down Main Street, U.S.A., Small World Mall and New Orleans Square. A Christmas Fantasy, Disneyland’s annual holiday parade, begins around the same time. Sleeping Beauty’s Castle becomes Sleeping Beauty’s Winter Castle – covered with shimmering icicles and twinkling lights. 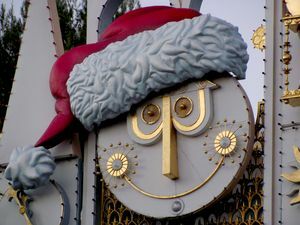 Several rides undergo a special holiday transformation: Haunted Mansion Holiday and “it’s a small world” Holiday. Santa Claus greets guests in Critter Country. Disney California Adventure celebrates the season with special decorations and entertainment offerings and the Festival of Holidays. This event features diverse cultural holiday celebrations, including Disney ¡Viva Navidad!, along with the global sounds of special guest musical groups. There is holiday decor in Cars Land and Buena Vista Street. World of Color – Season of Light, a special holiday version of World of Color, takes place on select nights throughout the season at Disney California Adventure. Holiday music transforms Luigi’s Rollickin’ Roadsters into Luigi’s Joy to the Whirl and Mater’s Junkyard Jamboree into Mater’s Jingle Jamboree. In Downtown Disney, there is ice skating on Olaf’s Frozen Ice Rink. The Downtown Disney Winter Village around the ice rink offers holiday gift items. Decorations in the resort hotels and Downtown Disney usually go up right after Thanksgiving (substantially later than the park decorations). Disney’s Grand Californian Hotel & Spa is decorated with Craftsman-inspired décor, including natural garlands, a Christmas tree lit with “arts and crafts” lanterns and a giant gingerbread replica of the hotel in the lobby. Holiday sweets can be purchased from the lobby’s holiday cart. The midcentury Disneyland Hotel receives a retro-holiday look with silver trees and bright colors. Disney’s Paradise Pier Hotel features blue, green and silver holiday décor—along with shells and starfish garland. In 2018, Santa will visit each hotel from November 22 through December 24. Vocal performers and holiday carolers will be performing throughout the holiday season at each resort hotel. For more information, visit the Disneyland Resort’s Holidays at Disneyland Resort page. In 2018, the Festival of Holidays at Disney California Adventure will be November 9, 2018 through January 6, 2019. The Festival of Holidays at Disney California Adventure features holiday festivities inspired by cultural traditions from around the world. Entertainment experiences throughout the park draw on the diverse celebrations that bring joy during this festive time of year, including Diwali, Hanukkah, Kwanzaa, Christmas/Navidad and Three Kings Day. This celebration also includes Disney ¡Viva Navidad!, a celebration of Latino cultures. The Festive Foods Marketplace features holiday favorites from different cuisines and traditions. As part of the Festive Foods Marketplace, there is a Sip and Savor Pass with eight pull-off tabs. Each tab can be traded for one food item or one non-alcoholic beverage at select Festive Food Marketplace locations. The Sip and Savor Pass costs $54.00, tax included, and can be purchased at various locations throughout the park, including the Festival Merchandise Carts, Seaside Souvenirs, Holiday Central, Kingswell Camera Shop, and Rushin’ River Outfitters. There is a discount for Annual Passholders. Please note: World of Color and World of Color – Season of Light are closed for refurbishment through 2018. The show will return sometime in 2019. World of Color – Season of Light, a special holiday version of World of Color, will be take place on select nights throughout the season at Disney California Adventure. This nighttime spectacular combines classic holiday songs with memorable moments from Disney animated films to create an experience filled with magic. Head into Redwood Creek Challenge Trail for Santa’s Holiday Visit, where you can meet Santa and see how his joyful elves have transformed the area into a playground of holiday fun and games. In the evening you can enjoy a concert at Paradise Park, featuring performances from two of the festival’s musical groups. For more information, visit the Disneyland Resort’s Festival of Holidays page. In 2018, Disney ¡Viva Navidad! at Disney California Adventure will take place November 9, 2018 through January 6, 2019. Disney ¡Viva Navidad! is inspired by the warmth and joyous spirit of Latino cultures, filled with holiday traditions, jubilant dancing and exciting music. Based in and around the Paradise Garden area of Disney California Adventure, the special activities include crafts and face-painting for children, live music, dance lessons, holiday foods, a Disney ¡Viva Navidad! Street Party and, of course, appearances by some popular Disney characters. Paradise Garden is decorated with holly, banners and Latino cultural icons, including traditional “papel picado” hand-cut paper art decorations. At the bandstand, guests can enjoy performances by traditional mariachi, Norteño, and other regional music groups. Community music and folklorico troupes will perform throughout the day. Disney ¡Viva Navidad! guests will find opportunities to enjoy fun arts and crafts, storytelling and face-painting, and they may also discover a selection of unique merchandise in the area. Dining locations in Paradise Garden feature Mexican dishes that are often served for the holidays. The Disney ¡Viva Navidad! Street Party takes over Paradise Garden several times daily, featuring the Three Caballeros on a festive holiday float, Mickey Mouse and Minnie Mouse transported on colorfully decorated street tricycles, flag-bearers carrying papel picado banners, Mexican folklorico dancers, samba dancers and drummers, plus giant “Mojiganga” puppets, including representations of Santa Claus and Mrs. Claus. The grand finale of Disney ¡Viva Navidad! is the special celebration of Three Kings Day (Día de los Reyes) in Paradise Garden. For more information, visit the Disneyland Resort’s ¡Viva Navidad! page. The Candlelight Processional at Disneyland Park is usually held the first weekend in December, with two performances each night, at 5:30 and 8:00 pm. Exact dates and narrators are not always announced in advance. The annual event includes a celebrity narrator presenting the Biblical Christmas story as well as an orchestra and hundreds of choir members from local communities performing traditional carols. The members of the choir walk down Main Street, U.S.A. with lighted candles and gather in front of the train station in Town Square for the performance. Seating for this event is invitation-only. However, the general public can watch from any place not reserved for performers or invited guests. If you plan to visit one of the theme parks on Christmas Day, be aware that it is one of the busiest days of the year. The parks (especially Disneyland) usually reach full capacity at some point during the day, and you may not be admitted (or re-admitted) to the parks after that point. (This is true even if you have a ticket, even if you’re staying at a Disney resort and even if you have dining reservations in the park. If the park is full, it’s full — Disney has to follow fire codes!) For that reason it’s best to arrive first thing in the morning and stay in the same park all day. Bring any sweaters or jackets you may need later and stow them in a locker when you arrive (the lockers will also sell out). Get Fastpasses right away if you think you will want to ride anything, because the lines will be very long by noon. The Bibbidi Bobbidi Boutique, located in Sleeping Beauty Courtyard at Disneyland, is an enchanting place where little royals can create their own wands, fill their own jewelry boxes, and explore a stunning array of storybook delights. The salon is owned by Cinderella’s Fairy Godmother herself and operated by her wand-toting Godmothers-in-Training. They’re wondrous whizzes with faux hair, accessories, jewels, beads, nail paints and other niceties. They’ve conjured up several royal hair styles: fairy tale princess, pop princess, Disney diva, Anna from Frozen or Elsa from Frozen. The boutique is open to princesses ages 3-12. You can book sessions up to 60 days in advance at (714) 781-STYLE (7895). A valid accepted credit card number is required at time of booking. There are occasionally limited-time discounts or deals for Annual Passholders and Disney Vacation Club members, so if you are one or the other, be sure to ask when booking and at check-in. Note that you can bring your own princess costume from home and save a fortune vs. buying a costume at the Boutique! Thanks to Carla C for info. A touch of Bali comes to the Disneyland Resort at the Mandara Spa at Disney’s Grand Californian Hotel & Spa. With its rustic stonework and finely crafted wood accents, the spa’s natural look and feel beautifully complement the hotel’s classic Arts & Crafts theme. Select one of the specialty massages and, after a restful stop in the Tea Pavilion, you’ll be led to one of the private treatment rooms for a Swedish, Sports or Deep Tissue massage. The spa can even accommodate couples wishing to enjoy a massage together. Other offerings include a variety of facial and full-body treatments, as well as manicures and pedicures. For reservations call (714) 300-7350. Annual Passholders receive a 20% discount off standard treatments Monday – Thursday and 10% off standard treatments Friday – Sunday. Disney Visa cardholders get 10% off spa services. You must use a valid Disney Visa card to purchase the services. Groups of 6 or more qualify for a 10% discount. Splitsville is a luxury bowling alley with great food, located in Downtown Disney. They also have live bands performing every Saturday night from 9 pm – 12:30 am. There is no cover charge. Birnbaum’s Disneyland Resort 2019 includes a coupon for 10% off bowling for groups of 10 or less. Cannot be applied to lane reservations or private events. Expires 12/31/19. Disney Vacation Club members can attend Member Nights, most Wednesdays at 6:00 pm for $55 plus tax per adult (age 10 an up) and $45 plus tax per child (age 9 and under). This includes 2 hours of bowling time, shoe rental, one shared appetizer (per 2 people), an entrée (or kid’s meal), a beverage and member-only bowling socks. Advance reservations through Member Services are required; check the DVC member site for blockout dates. From time to time, Disneyland offers special discounts to Annual Passholders, Disney Vacation Club members and Disney Visa cardholders on various park tours. Reserve a tour up to 30 days in advance by calling (714) 781-4400, or stop by City Hall on Main Street, U.S.A.
Get a behind-the-scenes look into Walt Disney’s love for trains and discover the impact it had on his magical creations. This 2-hour tour begins with a beverage and donut and then a walk through Disneyland while you hear about the impact trains have had on Walt Disney’s dreams—from animation and film all the way to the theme parks. Then enjoy riding the Disneyland Railroad while sitting in the Lilly Belle, Disneyland Railroad’s special parlor car — it’s not usually available for guests to ride, but on this special tour it is! Participants receive a collectible souvenir specific to this tour. This tour costs $85 per person (age 3 and up). Park admission is required and is not included in the price. Disneyland Annual Passholders receive 15% off the regular price of this tour. This 2.5-hour walking tour focuses on the history of the Haunted Mansion attraction. During your walk around Disneyland park, you will hear stories about what inspired the Imagineers who created it, as well as getting to visit with one of the characters. You will receive a treat, special collectible pin and credential souvenir keepsake. This tour costs $85 per person (age 3 and up). Park admission is required and not included in the price. Disney Vacation Club members receive 15% off the regular price of this tour. Disney Visa cardholders receive 15% off the regular price of this tour. You must use a valid Disney Visa card to purchase the tour. This seasonal holiday-themed tour includes information about Disneyland holiday traditions, reserved seating at the Christmas Fantasy Parade, a sweet treat and warm beverage and a collectible pin. This 2.5-hour tour is offered daily during the holiday season (mid-November through early January). Experience Disneyland from its founder’s perspective – his inspirations and his challenges while designing his first theme park. Highlights of the 3-hour tour include an exclusive look into Walt Disney’s private apartment (if available, sometimes it is another non-public part of the park), a private lunch or dinner on Main Street U.S.A., two classic attraction experiences and a collectible pin. This tour costs $109 per person (age 3 and up). Park admission is required and in not included in the price. Disneyland VIP Tours are private tours just for your group. You’ll be led around by a Host or Hostess who will tailor the tour to your interests. They can usually assist you in experiencing the attractions with minimal waits (you don’t always skip the lines, but they know which rides will have the shortest lines at which times and in many cases they are allowed to use the FastPass entrance). When you set up a VIP Tour, you can also request restaurant reservations, special viewing areas for certain shows and parades, etc. The cost is $400-$550 per hour for up to 10 guests (varies seasonally and higher rate applies if booked less than 48 hours in advance). There is a 6-hour minimum. Park admission is required. There are no discounts on the VIP Tours. You can arrange a VIP Tour by calling Disney Special Activities at (714) 300-7710. Unlike the other tours, VIP Tours can be booked 90 days in advance.